We envision a healthy and resilient Gulf of Maine where people and aquatic life thrive.The Gulf of Maine is a world-class natural wonder that is shared by the Provinces of New Brunswick and Nova Scotia, and the States of Maine, New Hampshire, and Massachusetts. People rely on it for their livelihoods, for recreation, and for personal renewal. Every five years, the Gulf of Maine Council on the Marine Environment renews its commitment to working together in addressing the Gulf’s most pressing issues that require a unified, regional response. 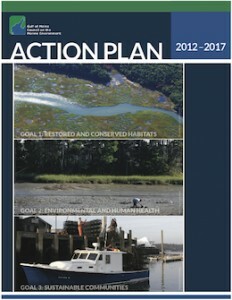 The 2012–2017 Action Plan describes the goals, outcomes, activities, and crosscutting initiatives that the Council and other organizations are pursuing to achieve the long-term vision of a healthy and resilient Gulf of Maine.